IN THIS week's absurd public transport meltdown, one of the very few links between Greenwich and the rest of the world which mostly kept going was also the least well-known, but arguably the best one, of all. Even now, astonishingly few people seem to realise that there is a fast, regular and frequent riverbus service between two piers in Greenwich and central London - with rush-hour and evening service to Woolwich, too. It runs every 20 minutes for most of the day - see the timetable on the Thames Clippers website here - and on the fairly rare occasions when I don't cycle into town, it's my method of choice. I several years ago largely gave up on mainstream public transport - a course of action I cannot recommend too highly. Buses and tube, in particular, are now exercises in low-level misery; until you stop using them, you just don't realise quite how much they blight your life, how much time and mental energy they waste and how much money they screw out of you. But there remain a few public transport options that are a genuine pleasure to use - and now, with the roads still a bit slippery for cycling and the Southeastern trains not back to a full service, is the time to discover one. It's time to liberate yourself from your cattle-truck carriages, your subterranean holes full of other people's germs, your traffic jams and points failures; time to travel to work with the wind in your hair and the matchless spectacle of the world's greatest city before your eyes. As well as the views, you will find a seat, a good punctuality record and even a little counter selling tea and coffee.True, the single fare from Greenwich (£5) is about twice the train price - but if you buy a monthly season (£100) and work within walking distance of one of the central London piers (Tower, London Bridge, Blackfriars, Embankment or Waterloo) you will pay almost exactly the same. The neglect of the river is one of London's great transport scandals. We have spent the last twenty years - and will probably spend most of the next ten - tying ourselves in knots about Crossrail, with still a quite serious chance that it will not be built. But we already have a waterborne Crossrail, an almost unused six-lane highway through the middle of the city, which could be brought into the full embrace of the TfL system for a fraction of the cost. Yet the existing service isn't even integrated with the rest of the network - no Oyster pay-as-you-go (yet), no Travelcards (Travelcard holders do get a one-third discount). 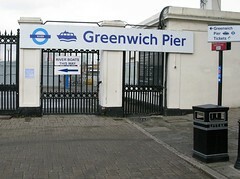 Greenwich council has recently started what it calls the "Clipper Campaign" calling for Oyster acceptance and a 10-minute peak-hour service. Very laudable aims, although I should point out that TfL had already promised to install Oyster readers for pay-as-you-go on the river service several months before the council started its campaign. Could Greenwich be trying to claim credit for achieving something that is going to happen anyway? The council website says that "the Mayor of London has given no date for installing the Oystercard equipment on the boats." That is perhaps a little misleading: I'm not sure what Boris himself has said, but his Transport Commissioner, Peter Hendy, told the last meeting of the TfL board that Oyster PAYG on the river was a "Mayoral priority" which "could be introduced by mid-2009." Answers last month to the Tory London Assembly member Gareth Bacon suggest that Greenwich's "campaign" for the riverbus does not, so far, seem to have involved any contact with either the Mayor or TfL. As the local Tory leader, Councillor Spencer Drury, said: “I am curious what sort of campaign fails to contact the person or organisation which it is seeking to influence." It's also worth pointing out the serious possibility that the Thames Clipper service will in fact contract, not increase, in the next few months. The extension from Greenwich to Woolwich is subsidised by TfL and the council, and was originally supposed to end this month, after the opening of the new DLR station. The subsidy has now been extended by another six months. It would be a shame if the next action of the leaders of the "Clipper Campaign" was to actually, well, clip the funding they give to the thing they're trying to promote. Still, let's not bash the council spin-doctors too heavily this week. Their overall aim is good, and even once Oyster is available on the service, the real battle - for Underground-style fares and Underground-style frequencies - still needs to be waged. In the meantime, take to the water. Even if it snows again, the Thames is most unlikely to freeze over. Be wary of using Thames Clippers – I waited at Embankment pier for the last two boats on a cold winters night and they all failed to arrive – but the elecronic indicator board clearly stated the boats were running and even gave a countdown, in minutes, as to when they would arrive. I almost got stranded in London. This is a serious health and safety issue – what happens when a young woman gets stranded? There was no warning on the TFL website that the services were not running. The pier was open and so was the waiting room. The electronic indicator board clearly stated the boats were running. The Thames Clipper number phone number never works. Apparantly others have experienced the same problem. I will never use Thames Clippers again. I have to counter Steve Dexter’s comment. I use Thames Clippers daily and have done so for many years now. The service has vastly improved over that time as the company has grown-up and developed. The services are not perfect, but these days 95% turn-up on time and it is infinitely better than any other option. Who would choose to be squashed like a sardine on the trains or DLR when you could be guaranteed a comfortable seat with space to work while you travel? I will happily accept some variability due to seasonal tides for a tranquil commute in a clean and pleasant environment. Regarding personal safety, my wife and I find that the Clippers are infinitely safer than South Eastern Railway or the buses as the boats are crewed at all times and the piers manned during peak hours. In short the boats are something we in Greenwich are very lucky to have and I fear that in the midst of recession we need to use them or lose them. Removing the subsidy would be a very easy way for Boris to tighten his belt and I am not sure that the economics of the commuter service stack-up as a pure private enterprise. I also use Thames Clippers on a regular basis but, with respect, TJB, I was left stranded late at night because Thames Clippers gave incorect information. I don’t think you would be happy if your wife was left stranded on like that. Its a serious issue. The odd boat failing to arrive during the day is not so bad but when at the last two or three boats of the night fail to arrive inspite of the fact that the indicator boards say they are due is very dangerous and not acceptable. Steve I am confused. In your first comment you said you will never use Thames Clippers again but in your second you said that you regularly use the clippers. I presume you mean that you used to regularly use the boat. I wish you joy with South Eastern or TFL but I fear you may be “cutting off your nose to spite your face” by boycotting the boats over this incident. In the past whenever I had a complaint about the service (and there were plenty of teething problems in the early days of the service with the new boats) an email to the CEO Sean Collins elicited a phone call within a few hours to apologise and explain how the problem would be put right going forward. The indicator boards at piers have never really worked that well. I think they work in on the same system as the bus stop tickers and therefore may well not be under the control of the boat company. “Kindly note that due to the inclemant weather & for the safety of our crew returning home this evening, we have had to cancel part of the service this evening. The last Westbound boat from Woolwich will depart at 21h38. On balance I think that compared to all the other options the boats are pretty good. Without them I would not have been in work on Monday as there were no other practical options to getting from Greenwich to the West End in the snow. Hello TJB – sorry I didn’t mean to turn this into a long debate. And I think I am not very clear at times. I have used Thames Clippers since the service began and most of the time its a good service – However on 2nd Feb I was left stranded late at night on Embankment pier because Thames Clippers had stopped running the boats even though the pier was open and the indicator boards were saying the service was still running. At twenty to twelve at night the indicator board suddenly said services were ended for the day – I had been waiting for an hour and at least the last two boats failed to show up even though the indicator board said they were due and even gave a countdown to when they would arrive. I ended up having to get a tube and walking for half an hour through a part of London where i was previously mugged. All I am saying is that if a service is not running then passangers should be informed that this is the case – espeically late at night with the last few boats. I am very concerned that this will happen again, for example to a lone woman, who could end up in trouble. With regard to the web site information – it may have been on the Thames Clippers site but this information was not on the Transport for London web site – nor was it yesterday because i checked. And we can’t all check the internet before catching a boat. As i mentioned: the pier was open and lit, so was the waiting room, the indicator board said the services were still running, it was perfectly reasonable to assume they were running. I wasnt the only one waiting that night so it wasnt jus me being stupid. Any how I hope you continue to enjoy the boats and that you dont encounter the same problem as me. TfL still struggles to understand the river services and, don’t forget, this regular Thames commuter service is relatively new. TfL’s London River Services began operating in 1999: the London Transport Passenger Board, which first coordinated public transport in London, began operation in 1933. Previous attempts to mount a Thames water bus service soon failed but Thames Clippers has made remarkable progress since it first started. To see the lack of integration between water and the other passenger services, go to TfL’s Journey Planner website at http://journeyplanner.tfl.gov.uk/. Start at the O2 and end the journey at Tower Hill. The guidance begins ‘Walk to North Greenwich’. Is it surprising that London River Services can’t get the pier information right when TfL still appear to be unaware that there is a very well used pier at O2? I don’t want to detract from the riparian campaigning of Chris Roberts but I believe that the continuing conversations between Shaun Collins, CEO of Thames Clippers, and Tfl might be rather more substantive than Chris Roberts’ petition. A couple of years ago I invited the Board of TfL for an afternoon out on the Thames and Shaun Collins, always a friend of those supporting river passenger and freight transport, provided the Hurricane Clipper, free of charge. Dave Wetzel led the TfL contingent and representatives of the PLA and London First also joined the trip. One of the points made was the need for integrating the Oyster Card system and I also pushed for closer alignment of bus stops with operating piers and for the Journey Planner to include the river services. It’s beginning to change with Thames Clippers announcing Oyster card use later this year but bus stops are often still a long way from the piers and the information given at the piers – and on Journey Planner- still leaves a lot of room for improvement as the comments have shown. In 2012 we will really need a good river service else London Transport will grind to a complete halt. The main Olympics site lies alongside the River Lee and the Lee runs into the Thames and is also linked by the Limehouse Cut to the marina at Limehouse basin. A boat service from Thames side rail termini to Limehouse and thence to Bow Locks would keep a lot of visitors off the other, already congested services. And then there are the canals that also link to Limehouse and the Lee. The river remains a grossly underutilised transport resource and it offers the most pleasant mode of travel, specially on a bright sunny day. But TfL still suffers the legacy of Ken Livingstone who once told me that Thames transport could never be energy efficient because of the ‘fierce tides’. Every trip against the tide is matched by one going with the tide. Ken, who rarely listened to anyone disagreeing with him, just walked off in the middle of my reply. Yes, river services could be improved but only when Transport for London begin to understand the river’s potential and its tidal nature. The pressure for improvement needs to kept up, not on Thames Clippers but on TfL. Anyone who is interested, let me know. Well I only ever use the O2 Express but I’ve always found it fast, friendly, efficient, professional and reliable, as well as being a beautifully scenic and stylish means of getting to and from the venue. And unlike Steve Dexter, when I called them on 08707 8150493 I got straight through to a helpful, freindly operator who immediately sorted out a ticketing problem (one of my own making, I might add). I’ve no vested interest – just think credit where credit’s due. Sitting at London Bridge pier waiting for the boat at the weekend, I couldn’t help but feel sorry for the woman selling tickets, trying to explain to tourists (and locals) the different ticket options available. They really could do with getting it streamlined, though I suspect it’s not entirely Thames Clipper’s fault.